A couple of fine folks (Bob Lennon and Kevin Sommers) decided to make their own archive of the magical events at the Strange Daze '98 festival here in the Buckeye State (i.e., Ohio), and then went off and self-produced CD-R's to go with their own Hawkwind fanzine. Great idea! Jerry and I were discussing the need for US space rock compilations for promotional efforts, and this CD-R means we don't have to do it! All 13 artists that performed over the three days are represented here and in the order that they appeared, so that it really does play back like an audio diary. Hence, locals Kid From Cleveland kick off the album with a brief instrumental piece "It's Time." I would have liked to have heard their version of "Tomorrow Never Knows" again (which really delighted me), but I understand the potential copyright problem there. Canis Minor then provide some cerebral progressive music in the form of "Le Moons" - one for Chapman Stick lovers. Pressurehed's "Black Mantra" is wonderfully psychedelic, and you can actually hear the vocals clearly (don't know how they managed that feat). I just wish I could see Rob Jacobs' fabulous cartoon movies again as I spin this disc. From Day Two, we start with Quarkspace's very interesting piece "Prince," which hasn't yet appeared on an official CD. Sampled voices ("Attention Alien Aircraft") and tape loops introduce this unusual tune (is that 7/8 time I hear? Freaky, man). The mix is slightly uneven, but Dave Wexler's excellent guitar soloing shines through nicely. Next, ST 37 and F/i contribute a tag-team of bass-heavy space-punk numbers and then Melting Euphoria throws in a quick rendition of "Summer Starchild." A little loose-sounding, but I liked the cascading riff and phased guitars. Alien Planetscapes offer "Mr. Sparkle," one of many blazing freakout numbers they performed that glorious evening. Finally, the so-called "StrangeWind" version of Hawkwind came forth to debut their "Starfire Mountain Dreaming," a track written on site just for us. Capt. Rizz+ proclaims, "It's your heart, it's your soul... It's you - It's all about you...It's all because of you." The sound quality is excellent here, and the intro seems to be what eventually was lifted for "Hippy" on "In Your Area." So I imagine that this item will become a real collector's item for Hawkfans in the future. Thom the World Poet wakens up Day Three accompanied by Drumplay, and tells us why we're all here today... as if we didn't already know. ArcMet then gets their chance in the sun a day or two later than expected, but does add their unique gothic touches to this psych-fest with "Sur le Tour." Born to Go cranks through "Millennium Crash," one of my favorites but unfortunately a little light on the all-important bass guitar on this recording. The festival-on-a-disc ends with Nucleon's "Green Acid," the proper choice for sampling their crunchy, space-doom sound. Having this item really helps keep fond memories alive... I look forward to playing it between sets at this year's Strange Daze and reminiscing about the great time we all had at the Ledges. Thanks to Bob and Kevin for being such great fans. 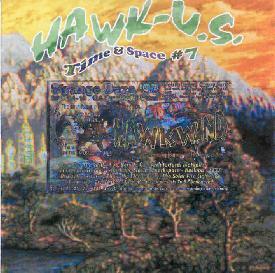 For more information you can visit Bob Lennon's HAWK-U.S./Time & Space Fanzine web site.